CO2 – I Can’t See It. Is It Really That Big a Deal? The Earth acts in many ways like a giant respiratory system. It naturally transpires approximately 750 billion tons of CO2 every year. On its own, the natural emission and absorption of CO2 is a fairly balanced process. However, humans contribute another 30 Billion tons of CO2 per year, an additional 4%, through burning fossil fuels. Regardless of politics, scientific fact shows that the additional CO2 being expelled into the atmosphere by humans has increased the amount of carbon in the sky from an average fluctuation of 180 to 280 parts per million over the past 800,000 years to 400 parts per million now. That number has no precedent in the last 800,000 years, and it is climbing steadily. Much of the dispute over global warming questions whether the increase of CO2 in our atmosphere is really responsible for increased temperatures. This argument suggests that warming is a geologic process that ebbs and flows over vast periods of time, and that the current increase in carbon in the atmosphere just happens to coincide with this natural cycle. Beyond the controversy regarding warming and the atmosphere, there is a second, overlooked effect that the annual 30 billion additional tons of CO2 is having on the Earth’s environment: it is dangerously altering the earth’s oceans. CO2 is not weightless, and it eventually falls to the Earth’s surface. Normally, when CO2 lands on the surface in the waters of the ocean, much of it is photosynthesized by algae. However, because of the excess amounts of CO2 falling into the ocean due to human output, scientists have found that more and more is instead combining with water molecules to form a carbonic acid, H2CO3. 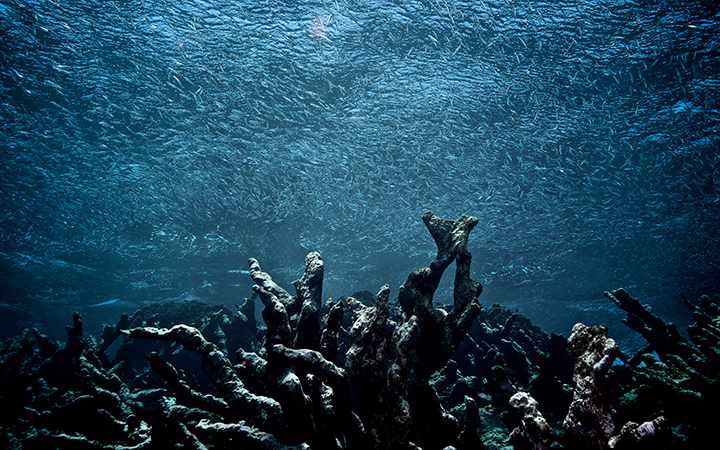 The result is that the oceans are becoming more acidic, which in turn disrupts sea creatures’ abilities to live and thrive all along the food web. Unless the amount of CO2 entering the oceans is reduced, or more can be absorbed by algae, by the end of the century, the Earth’s oceans are predicted to become acidic enough that most sea life as we now know it will be unrecognizable, or dead. Each American’s annual share of CO2 pollution per capita is 20 tons, or approximately 5.5 tons of carbon per person (stripping away the oxygen, Carbon is 27% of the atomic mass of CO2). In concrete terms, that means each person creates enough to fill five pickup trucks with carbon dust every year. All that carbon is filling our skies and descending on our land, and in our waters. It’s illegal to just throw your trash onto the street, into rivers, or into the oceans. Why then are we allowed to burn carbon fuels and pollute for free?